Transmissions are an essential part of any running vehicle. To keep your vehicle operating smoothly, it is crucial that you keep your transmission in optimal condition, avoiding any driving and maintenance habits that can contribute to the destruction of your transmission. 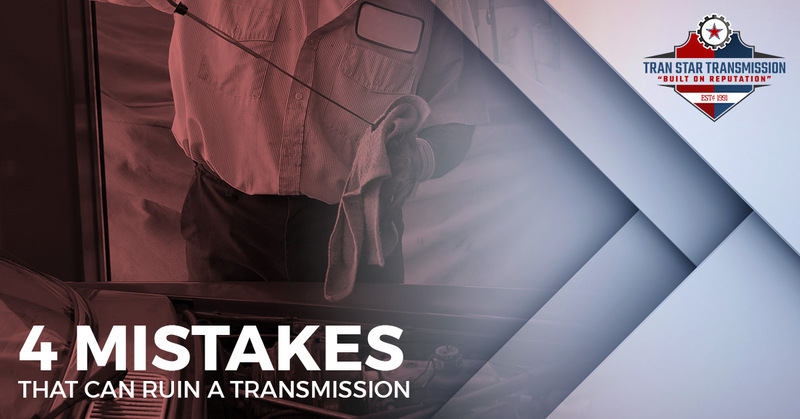 In today’s blog post, Trans Star Transmission would like to share with you some bad habits and mistakes that can damage your transmission. If you are having transmission problems and looking for a reliable Houston transmission shop, stop by our shop today. We can handle all of your transmission services — transmission fluid change, computer diagnosis, transmission rebuilds, and more! Contact us at (713) 574-1473 to learn more or to schedule your free diagnostic check! Here are four habits you should avoid to keep your transmission in optimal condition. High fluid temperatures are one of the most common culprits of transmission failure. In fact, it is estimated that around nine out of ten transmission failures are because of excessive heat. Similar to how the human body will start to feel bad and perform poorly when the body temperature increases, so will your transmission. The general rule is that for every 20-degree increase in temperature, your transmission’s life can be cut in half. Factors like transmission slipping, solenoid problems, heavy towing, hot climate, and lots of stop-and-go driving can increase the risk of overheating. To prevent overheating, gauge your transmission with a temperature gauge, and if you tow a lot, consider installing transmission coolers. Transmission fluid is the blood of your transmission. Without it, or with the wrong kind, your transmission is doomed to fail. For automatic transmissions, transmission fluid lubricates all the parts, provides hydraulic fluid pressure, and helps cool the transmission. When you neglect to keep the fluid at an optimal level, you will make your transmission work harder, increasing the likelihood of failure. To prevent this from happening, make fluid-level checks a regular part of your maintenance routine. This will ensure that you identify and remedy any leaks or problems promptly. Similarly, just as important as it is to keep an eye on fluid levels, it is just as important to make sure that you are always using the appropriate type of fluid. Not all transmission fluids are the same. Consult with your local transmission shop to find out what type of fluid is best for your vehicle. When you quickly shift from reverse to drive, this takes a toll on your transmission. For example, if you are stuck in the mud or snow, avoid rocking your car back and forth in an attempt to get out of your jam. Additionally, not getting your transmissions serviced every 30,000 to 60,000 miles is also a form of abuse, albeit a slow and more subtle form. Whether your vehicle needs a transmission fluid change or a complete transmission flush, getting the service your car needs will work wonders for keeping your vehicle and transmission in optimal condition. Another mistake is ignoring problems. Just as the body will signal that there is a problem through symptoms, so will your vehicle. Don’t ignore these signs. If you hear a strange noise while changing gears or feel a grinding, shaking, or slipping, something has gone awry. Get your automobile to a transmission repair shop ASAP. An experienced transmission specialist will be able to diagnose the problem and offer recommendations. Need a transmission repair, replacement, fluid change, or diagnostic test? Stop by Tran Star Transmission today! We offer free diagnostic checks! Give us a call at (713) 574-1473 to learn more!